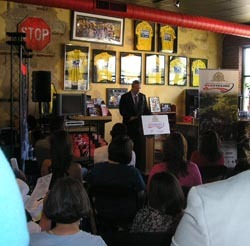 With three consecutive years of strong crowds and community support, the Greenville Hospital System USA Cycling Professional Championship will return to Greenville, S.C. for its celebrated weekend of racing and family events, August 29-30, 2009. Two-time U.S. Professional Road Race national champion George Hincapie (1998, 2006), who resides in Greenville, announced at a press conference today that he will return in an effort to recapture the famed Stars and Stripes jersey. Three-time U.S. National Pro Time Trial champion Dave Zabriskie (2006-08) of Salt Lake City, Utah is expected to return as well for a fourth consecutive title. "I'm excited to race in Greenville again for the USA Cycling Pro Championships," said George Hincapie, a Tour de France stage winner and 16-year pro cyclist who now rides for Team Columbia. "I love racing in front of family and friends, so it's awesome to have the race right here in my back yard. It is quite an honor to wear the Stars and Stripes jersey, so I'll be trying my best to win it again this year." New for 2009, the dual championships will also host two races for the U.S. Handcycling Series, presented by the Paralyzed Veterans of America. Greenville will be the season-ending finale for the U.S. Handcycling's 2009 calendar on Aug 29-30, utilizing the same courses for the best Americans on bicycles for elite Americans on handcycles. The handcycling races will be the warm-up events for the world championships in late September. On Saturday, Aug. 29, the Professional Time Trial Championship will return to the Clemson University International Center for Automotive Research (CU-ICAR). This course will also host a time trial for U.S. Handcycling the same day. The proximity to downtown Greenville and the compact, closed course make it both easily accessible and engaging for fans. On Sunday, Aug. 30, the 110-mile Professional Road Race Championship will remain at the start/finish location from last year in the West End section of downtown Greenville. This area will also stage a criterium for U.S. Handcycling and the start for the 4th annual Stars and Stripes Challenge, a recreational bicycle ride produced by the Palmetto Peloton Project to generate awareness and funds for cancer research. "GHS is honored to serve as title sponsor of the USA Cycling Professional Championships for a fourth year and to be a recipient of the Palmetto Peloton Project (P3)," said GHS President and CEO Mike Riordan. "We are grateful for P3's gift to cancer research because it not only impacts the people in our community but people across the county and around the world. In addition, P3 events, such as the Stars and Stripes bicycle ride, offer our community an opportunity to get out and be active, which reinforces our commitment to total health. GHS is also pleased that Medalist Sports is adding a handcycling event to this year's USA Cycling Professional Championships. Handcycling is an impressive sport that showcases not only athleticism but the courage and determination of participants with and without disabilities." The press conference, hosted by Hincapie Sportswear in Greenville, also introduced Duke Energy as a new Presenting level partner for Championship weekend. Duke Energy will be involved in several of the community-oriented events in the Upstate. "Duke Energy Carolinas is proud to participate as a Presenting Level Sponsor for the Greenville Hospital System USA Cycling Professional Championship this year," said George Acker, Director of Southern Region Government and Community Relations. "This is an exciting event and a wonderful opportunity to showcase the region while raising money for cancer research." This will be the first time in four years of the dual championships that major college football will open a week after the event, expanding the national focus on the championships. A one-hour highlight program will be broadcast nationwide one week after the event (date/time to be confirmed) by new broadcast partner, the Universal Sports Television Network. WYFF-4, the NBC affiliate in the Upstate, will broadcast the same program locally on Saturday, Sept. 5 from 2:30 - 3:30p.m. "We are excited to continue to raise the bar year after year with this event," stated Chris Aronhalt, Managing Partner with Medalist Sports and the event's Executive Director. The event has been managed all four years by Medalist Sports, a sports marketing company that specializes in planning, promotion and management of multi-day, multi-jurisdiction sports. "In addition to the significant funds and awareness generated by the Palmetto Peloton Project for two important cancer advocacy and research programs, the event itself and the level of competition continue to grow in stature. We are honored to be part of a fourth year and wish to thank our sponsors and partners, as well as the city and county of Greenville." This will mark the 25th anniversary of the Professional Road Race Championship. After 21 years in Philadelphia, Pa., USA Cycling, Inc. moved the Professional Road Race Championship to Greenville in 2006. That same year the Professional Individual Time Trial Championship was added to the lineup for the first time to make the event a dual championship for the top professional American cyclists. Since 2006, Greenville has generated huge crowds for the event, averaging close to 65,000 each year. Greenville Hospital System University Medical Center (GHS), one of the largest not-for-profit healthcare providers in South Carolina, returns for a fourth year as title sponsor for the championship weekend. In addition, GHS' Oncology Research Insitute will continue as a major recipient of the Stars and Stripes Challenge. Last year a record $110,000 was presented for cancer research by the Palmetto Peloton Project (P3) with Stars and Stripes Challenge events. In the three years that the P3 organization has partnered with the Championships, it has raised over $400,000.. Funds this year will be distributed to GHS' Oncology Research Institute, the Lance Armstrong Foundation and Activate Upstate. Route maps and details for each professional race can be found at the official web site, www.usacyclingchampionships.com. In addition, the Web site offers online registration for volunteers, which are needed for both days. Medalist Sports is a full-service international sports marketing company. Medalist Sports specializes in the planning, promotion and management of multi-day, multi-jurisdiction sports and special events. The Medalist Sports team has experience in all facets of the successful management and promotion of world-class sporting and cycling events in the United States, England, Australia and China. Clients and event experience include the Tour DuPont, Tour de Georgia presented by AT&T, Amgen Tour of California, Tour of Missouri, USA Cycling, Inc. and the Lance Armstrong Foundation's LIVESTRONG Challenge Series. Medalist Sports' headquarters are located south of metro Atlanta at P.O. Box 415, Tyrone, GA 30290. The company website is www.medalistsports.com. Greenville Hospital System is one of the Southeast's leading healthcare providers, nationally recognized for advanced technology, innovative research and teaching excellence. The system's five campuses include a Level I trauma center, three acute-care hospitals and numerous outpatient facilities. GHS' Cancer Center offers the region's broadest array of cancer specialists, many working through the Oncology Multidisciplinary Center. This multidisciplinary approach to the effective management of cancer allows patients to meet with a medical oncologist, radiation oncologist and surgical oncologist to receive a comprehensive treatment plan all in one day. More information is available at www.ghs.org. The Palmetto Peloton Project (P3), based in Greenville, S.C., exists to promote the advancement of cancer research and advocacy efforts locally, regionally and nationally through fundraising cycling events. Through support from local businesses and enthusiastic cyclists, the Palmetto Peloton Project has raised over $400,000 for cancer research and advocacy since its inception in 2005. In 2009 as part of the Greenville Hospital System USA Cycling Professional Championships, P3 will host the "Stars and Stripes Challenge" for a fourth year, a recreational cycling event to support local cancer research. For more information, visit www.palmettopelotonproject.org. Universal Sports, a partnership between NBC Sports and InterMedia Partners, serves as the preeminent multiplatform destination for Olympic-related and lifestyle sports programming available on television and online. Universal Sports is a 24-hour television channel available in more than 45 million television households nationwide. Major world championship and Olympic qualifying events found on Universal Sports range from track and field, skiing, swimming, gymnastics, marathons and cycling, to volleyball, rowing, triathlon, fencing, speed skating and martial arts. UniversalSports.com delivers an immersive experience via live and on-demand competition coverage, interaction with top athletes through blogs and in-depth access to Olympic sports news and information year round. For more information on the availability of the Universal Sports 24-hour television channel, please visit UniversalSports.com. Hincapie Sportswear, Inc., headquartered in Greenville, S.C., is a manufacturer and marketer of distinctive clothing for the performance cyclist. In addition to making custom cycling apparel and accessories for clubs and teams throughout the U.S., the company also creates a full line of premium retail cycling apparel and accessories for men and women. Most recently, Hincapie has introduced Hincapie SkinDefense SPF 30 Sunscreen and Hincapie Premium Denim, a fashionable new collection of designer denim for men and women. For more information, visit Hincapie.com, HincapieSkinDefense.com and HincapieDenim.com. Recognized by the United States Olympic Committee and the Union Cycliste Internationale, USA Cycling is the official governing body for all disciplines of competitive cycling in the United States, including road, track, mountain bike, BMX and cyclo-cross. As a membership-based organization and sanctioning body, USA Cycling consists of 64,000+ members, including 57,000 competitive cyclists, 1,500 coaches, 4,000 student-athletes, 2,200 officials, 350 professional cyclists, and 200 certified mechanics. USA Cycling also sanctions 2,500 competitive and non-competitive organized cycling events throughout the United States annually, as well as 1,800 clubs and teams. Associations of USA Cycling include the United States Cycling Federation (road, track & cyclo-cross), the National Off-Road Bicycle Association (mountain bike), the BMX Association, the National Collegiate Cycling Association and the United States Professional Racing Organization. USA Cycling is also responsible for the identification, development, support and promotion of American cyclists through various athletic initiatives and programs including the USA Cycling National Development Team, the USA Cycling Women's National Team, the USA Cycling Junior Development Team, Talent Identification and Regional Development Camps, domestic and international race calendars, direct athlete funding and support programs, and educational camps and seminars. For media-related or general inquiries, please contact USA Cycling Director of Communications, Andy Lee at 719-866-4867 or alee@usacycling.org. United States Handcycling Federation, is an association of individuals and organizations that creates integrated cycling opportunities for wheelchair users and athletes with lower-mobility impairments, including disabled veterans and members of the U.S. Armed Forces. The U.S Handcycling Series, presented by the Paralyzed Veteran's of America, is the premier Para-Cycling racing series in North America and will feature more than 150 of the World's top cyclists with disabilities, racing at major - integrated - cycling events across America. Shining the spotlight on the elite athleticism of Paralympic cyclists, this series focuses on the "ability" rather than the "disability" of its participants, most notably disabled veterans. Visit www.ushf.org.